Faith is 4 years and 2.5 months, to be exact. We were told not to expect much. We were told she would not walk, talk, see, hear. We were told she would probably not breath on her own, or ever be able to eat. Faith has overcome all that...she has reached those milestones. She is putting together 3 and 4 word sentences, that actually make sense. She is breathing and eating on her own. She loves us, and cuddles and snuggles with the best of them. She does have seizures, which do affect her brain (to some extent). We have been left in limbo, when it comes to toilet training. We have been told not to set our expectations too high in this area. We have been planning for school next year, with diapers, wipes and changes of clothes. 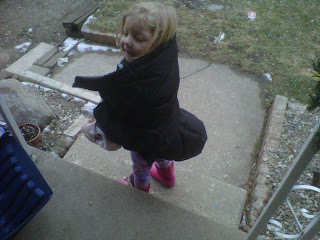 We didn't have any diapers, so we left her with just pants on until we got some. She went 3.5 hours with no accidents, and she peed on the toilet. Started bugging daddy "daddy, daddy, oh oh, oh oh..."
It is hard to have expectations, and be told not to have them. And then she does this. Amazing! God Bless your little miracle baby! She gives me a little more "Faith" with each milestone she passes! Oh my gosh, such wonderful successes!! I would be so stoked with each milestone! Amazing!! YAY way to go Faith! Wow. How awesome! What a determined little spirit! Happy WW! Never get weary in believing for the impossible! Wow, this brought tears to my eyes! What an amazing little girl!